ESPN Scrum.com are reporting that Luke Charteris is off to Perpignan. Having arrived at Newport Gwent Dragons in 2003 from Llanelli, he ends his association with the club at the end of the 2011-12 season. It’s a big call from the big man, and one that is damaging not just to the playing side of the region, but to their identity. Charteris was named as club captain at the start of the season, and proceeded to put in a storming campaign in Welsh colors. Long written-off as a player who excelled in his role as a jumper in the middle of the line but had to be carried in other phases of the game, he proved his doubters wrong with a series of games defined by his big tackle-count, high workrate and physicality in the tight. With the emergence of Dan Lydiate and Toby Faletau in the tournament, the Dragons had gone from being the runt of the Welsh litter to a side that contributed three starting members of the national pack. His departure will rock the region back on its heels. He is one of only two players in the current squad who were part of the set-up when the Dragons were formed in 2003, and has played 136 matches for the club. He has contributed a great deal to the Dragons during his time at the club, but it cuts both ways: they have essentially turned him into the player he is today, and afforded him a huge deal of gametime all the way up. Now that he is entering his prime, his decision to leave the club – having only been announced as captain four months ago – will be an enormous blow. Whether purposely or not, it announces that once you’re good enough to attract interest from somewhere else, you’re gone. It’s not as though Perpignan are a dream destination at the moment. They recently sacked coach Jacques Delmas four months into his tenure with the club, and are currently struggling just above the relegation zone of the Top 14. They’re a club in disarray, and there’s a reasonable chance that they could find themselves playing in Pro D2 next year. Furthermore, Welsh coach Warren Gatland has already signaled that Welsh-based players will receive preferential consideration for national team selections. Charteris has only recently locked down a place in the national side ahead of Bradley Davies, and the big Cardiff man has strong international credentials, with 21 starts from his 32 Welsh caps; he’s got age on his side too, being the guts of four years younger than Charteris. Charteris is out for the next four months through injury, which will only allow enmity towards his decision to grow amongst Dragon fans. He won’t even be there on the pitch to help them recover from what has been a very poor start to their domestic season. To leave for Perpignan at this stage of his career is a curious, thought-provoking decision: the Catalans are known to pay big money and to attract big crowds, and were Heineken Cup semi-finalists last year. The south of France has a lot going for it ahead of either Newport or Gwent in terms of lifestyle, unless you’re a particular fan of shopping centres. On that front, it might seem like a no-brainer. On the other hand, it puts his newly-acquired starting place in the Welsh team in serious jeopardy, and he might end up playing his rugby next season in the French second division, big wages or not. Perpignan won’t be in the HEC next year, so it will be out of sight and out of mind on a European level. While it might sound far-fetched, this could be a decision that costs him a spot on the Lions. 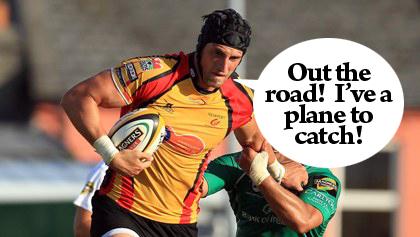 This entry was posted in News and tagged Luke Charteris, Newport Gwent Dragons, Perpignan by dementedmole. Bookmark the permalink.